After finding the infamous Heartbleed vulnerability along with a variety of other zero days, Google decided to form a full-time team dedicated to finding similar vulnerabilities. That team, dubbed Project Zero, just released a new vulnerability, and this one’s particularly graphic, consisting of a group of flaws in the Windows Nvidia Driver. When even our mice aren’t safe it may seem that a secure system is unattainable. However, there is light at the end of the tunnel. While the bugs found showed that Nvidia has a lot of work to do, their response to Google was “quick and positive.” Most bugs were fixed well under the deadline, and google reports that Nvidia has been finding some bugs on their own. It also appears that Nvidia is working on re-architecturing their kernel drivers for security. This isn’t the first time we’ve heard from Google’s Project Zero, and in all honesty, it probably won’t be last. An Experimental Study of DRAM Disturbance Errors” (PDF link). According to [Kim], the memory industry has known about the issue since at least 2012, when Intel began filing patents for mitigation techniques. “Row hammer” by Dsimic – Own work. Licensed under CC BY-SA 4.0 via Wikimedia Commons. The technique is deceptively simple. Dynamic RAM is organized into a matrix of rows and columns. By performing fast reads on addresses in the same row, bits in adjacent rows can be flipped. In the example image to the left, fast reads on the purple row can cause bit flips in either of the yellow rows. The Project Zero team discovered an even more aggressive technique they call “double-sided hammering”. In this case, fast reads are performed on both yellow rows. The team found that double-sided hammering can cause more than 25 bits to flip in a single row on a particularly vulnerable computer. Why does this happen? The answer lies within the internal structure of DRAM, and a bit of semiconductor physics. A DRAM memory bit is essentially a transistor and a capacitor. Data is stored by charging up the capacitor, which immediately begins to leak. DRAM must be refreshed before all the charge leaks away. Typically this refresh happens every 64ms. Higher density RAM chips have forced these capacitors to be closer together than ever before. So close in fact, that they can interact. Repeated reads of one row will cause the capacitors in adjacent rows to leak charge faster than normal. If enough charge leaks away before a refresh, the bit stored by that capacitor will flip. If you’re thinking that memory subsystems shouldn’t work this way due to cache, you’re right. Under normal circumstances, repeated data reads would be stored in the processor’s data cache and never touch RAM. Cache can be flushed though, which is exactly what the Project Zero team is doing. The X86 CLFLUSH opcode ensures that each read will go out to physical RAM. Wanton bit flipping is all fine and good, but the Project Zero team’s goal was to use the technique as an exploit. To pull that off, they had to figure out which bits they were flipping, and flip them in such a way as to give elevated access to a user level process. The Project Zero team eventually came up with two working exploits. One works to escape Google’s Native Client (NaCL) sandbox. The other exploit works as a userspace program on x86-64 Linux boxes. Viewed from memory address 0x20EA0, this is an absolute move of a 64 bit value to register rax. However, if we move off alignment and read the instruction from address 0x20EA02, now it’s a SYSCALL – (0F 05). The NaCL escape exploit does exactly this, running shell commands which were hidden inside instructions that appeared to be safe. 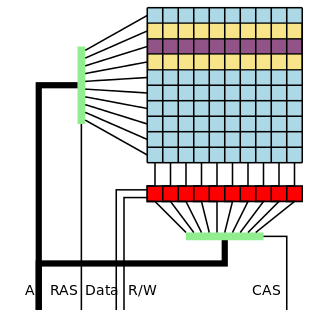 The Project Zero team used rowhammer to give a Linux process access to all of physical memory. The process is more complex than the NaCL exploit, but the basic idea revolves around page table entries (PTE). Since the underlying structure of Linux’s page table is well known, rowhammer can be used to modify the bits which are used to translate virtual to physical addresses. By carefully controlling which bits are flipped, the attacking process can relocate its own pages anywhere in RAM. The team used this technique to redirect /bin/ping to their own shell code. Since Ping normally runs with superuser privileges, the shell code can do anything it wants. Rowhammer is a nasty vulnerability, but the sky isn’t falling just yet. Google has already patched NaCL by removing access to the CLFLUSH opcode, so NaCL is safe from any currently known rowhammer attacks. Project Zero didn’t run an exhaustive test to find out which computer and RAM manufacturers are vulnerable to rowhammer. In fact, they were only able to flip bits on laptops. The desktop machines they tried used ECC RAM, which may have corrected the bit flips as they happened. ECC RAM will help, but doesn’t guarantee protection from rowhammer – especially when multiple bit flips occur. The best protection is a new machine – New RAM technologies include mitigation techniques. The LPDDR4 standard includes “Targeted Row Refresh” (TRR) and “Maximum Activate Count” (MAC), both methods to avoid rowhammer vulnerability. That’s a good excuse to buy a new laptop if we ever heard one! If you want to play along at home, the Project Zero team have a rowhammer test up on GitHub.